Nuestra historia de lucha, garantía de un futuro de democracia y socialismo 1920-1980. This sticker is part of a political campaign for the Partido Comunista de España (PCE) or the Communist Party of Spain. PCE is celebrating their 60th year anniversary. The image depicts a symbol from the powerful anti-war painting, Guernica, by Pablo Picasso. It shows a woman with her arm reached out in front of her holding a flame lit lamp. This icon brings back many memories to mind for the Spanish people such as the Civil War and the rule of Franco. In the original painting this figure was a symbol of hope, whereby implanting a similar message into the minds of the Spanish people in regards to the future of PCE. 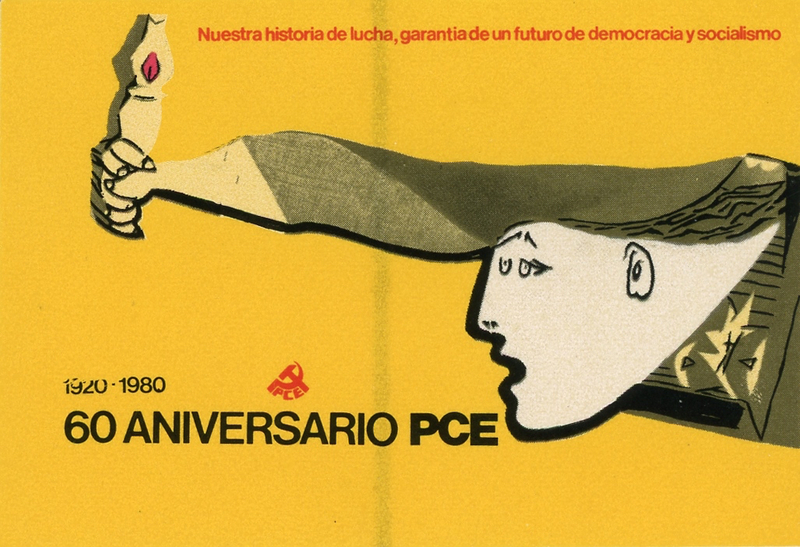 The previous year in 1979, the PCE obtained the 3rd largest number of votes in the municipal elections in Spain. This sticker focuses on the strong history of the PCE, encouraging people to stick with it and not change their votes to other parties such as the PSOE.